The other day Steve, my photographer husband, had to shoot some rhubarb for a client. Since winter was still in the air, I wasn’t sure that I could find it. But, lo and behold, I found bright pink stalks stacked up at my local Whole Foods. Once he photographed it, I couldn’t let it go to waste. So, what does rhubarb say to me? Spring! Strawberries! Pie! But there really has been no sign of spring here in New York City – as March stilled its winds we still had snow in the air. Besides, I really didn’t have enough rhubarb or strawberries to make anything significant. I cut what I did have into small pieces, added maybe a cup of sugar, a tablespoon or so of lemon juice, and grated a bit of fresh ginger into the mix. 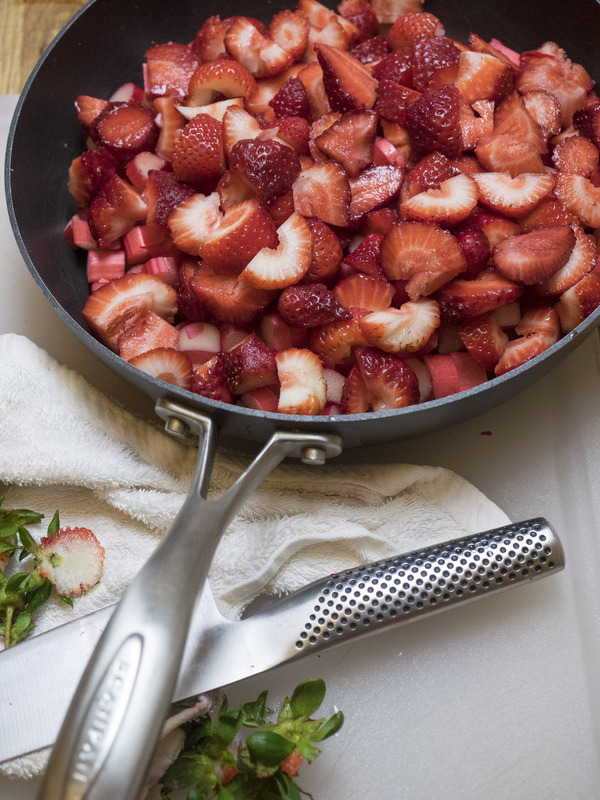 I popped it on the stove while we ate dinner and ended up with a lovely 10 ounce jar of rhubarb/strawberry compote that will be delicious over ice cream or yogurt, drizzled on roast pork or even on a slice of whole grain toast. But, most of all I had a taste of spring!